Image caption "Why didn't he condemn it in 1974? Why now?" - Julie Hambleton whose sister Maxine died in the atrocity asked. The sister of an IRA victim has rejected Gerry Adams' condemnation of the Birmingham pub bombings, saying it is too late. The outgoing Sinn Féin leader was speaking to the BBC's Andrew Marr as he enters his final week as president. Twenty-one people died when two bombs were detonated in Birmingham city centre in 1974. During the interview, Mr Adams said: "The Birmingham pub bombings were wrong". He added: "I would wish that no-one had been killed or injured in the course of the conflict. "We were able to come to an alternative. When you come forward with an alternative, sensible people will embrace that alternative." However, Julie Hambleton, whose sister, Maxine, died in the bombings, questioned why it had taken so long for Mr Adams to condemn the atrocity. "He's never condemned it before," she told the BBC's The Nolan Show on Monday. "Why didn't he condemn it in 1974 when it happened, 1975, 1976, 1991, when the Birmingham Six were released, where they allowed them to sit and rot in prison for a crime they didn't commit? "Why now? He must have an ulterior motive. Gerry Adams doesn't do or say anything without having an ulterior motive. "What has he done for victims for terrorism? "Terrorism does what it says on the tin. It terrorises and destroys lives. "We are the surviving relatives of 21 people who were killed in cold blood for absolutely no reason whatsoever. "We're going into our 44th year where we are still having to fight for truth, justice and accountability. "It is within his sphere of influence to to encourage the IRA to tell us if they did it, who did it, why they did it and provide the information so we can move forward." Gerry Adams has always denied being in the IRA. Ms Hambleton said that was "neither here nor there". "He is the leader of the political wing of the IRA. As such, he is in a position to influence others, not just the IRA. "He could help us to influence to get information from the PSNI, West Midlands police, the UK government, the Irish government, but most of all the IRA." Ms Hambleton said the impact of the last 40 years had been very difficult for the family. "For about thirty years we never confronted it. We never spoke about Maxine, it was just too hard. Even now it's just too hard. "She was full of life, she had her whole life ahead of her. "I never got to grow up with my big sister, see her possibly get married, possibly become a solicitor, have children where I could be their auntie. "My mum identified her in the morgue. Knowing the image that my mum has of her lovely daughter haunts her. "We wouldn't want anyone else to know what it feels like, to know how it wrecks lives," she added. For over 40 years the relatives of the victims of the Birmingham Pub bombings have been fighting for justice. 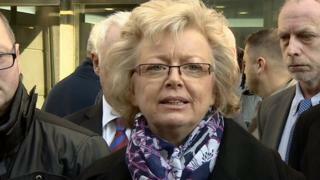 In January, a court ruled a coroner was wrong to restrict the scope of an inquest into the Birmingham pub bombings. Last year, BBC Northern Ireland interviewed a former IRA man, Mick Hayes, who was in Birmingham at the time. He apologised for the bombing and said he took collective responsibility for the IRA's activities in England, including the 1974 pub bombings. Gerry Adams, who is 69, is due to step down as Sinn Féin leader next weekend, when he will be replaced by Mary Lou McDonald.